Yes. My ugly habit of “packing” has reared its ugly head once again. It looks so beautiful while stretched tightly on the frame, but take it off and hang it up and it has buckles and bows in it that weren’t meant to go on shoes! For anyone who wonders what “packing” is…it’s pulling either the loops or the rows too closely together so that the hooking doesn’t lie flat when it is off the stretched frame. This can usually be corrected with a good steaming, but I want to fix most of it by re-hooking the problem areas. So after slapping myself on the wrists since I should know better, I’ve been fixing it as I continue to hook the background. In this photo I’ve already adjusted the scroll of the cancer sign, but there is still buckling in other areas, as you can see. When I hooked this section of the background and hung it up, I wasn’t pleased with the outcome (quite apart from the packing). Let me back up and explain. I’m very much a visual learner. (which surprised me when I discovered it, because I have spent the majority of my life as a singer and vocal teacher. )….but I am not an auditory learner, I learn primarily by seeing. That’s why, many of my hooking decisions are made after I hang my piece and look at it for a period of time. I had been merrily hooking away on an echo background, letting the echos merge where they would….but in this part, the background was all wrong…..whereas this part…. ….the background was right. 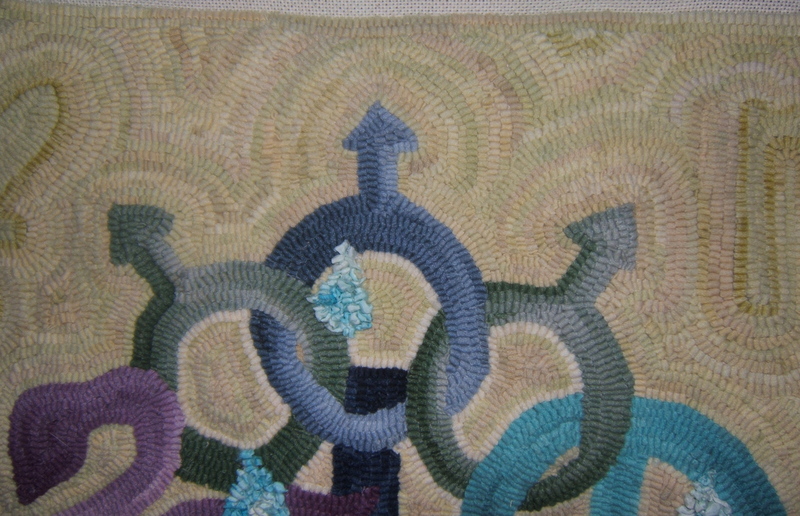 As I looked at it I realized that what I liked was the rippling out effect from the main body of symbols….It seemed to add life and vitality to what symbolically was me. Now my hooking of the background is no longer without specific direction, and I will redo large parts to enhance that ripple effect. These two supervise my every move and were obviously disgusted with my packed hooking…..Hopefully they’ll approve of the finished version a little more. This entry was posted in backgrounds, Signa Meus Vita, special effects, tweeking, Uncategorized by elizabethmartel. Bookmark the permalink. Elizabeth at least you look and correct. Some do not. 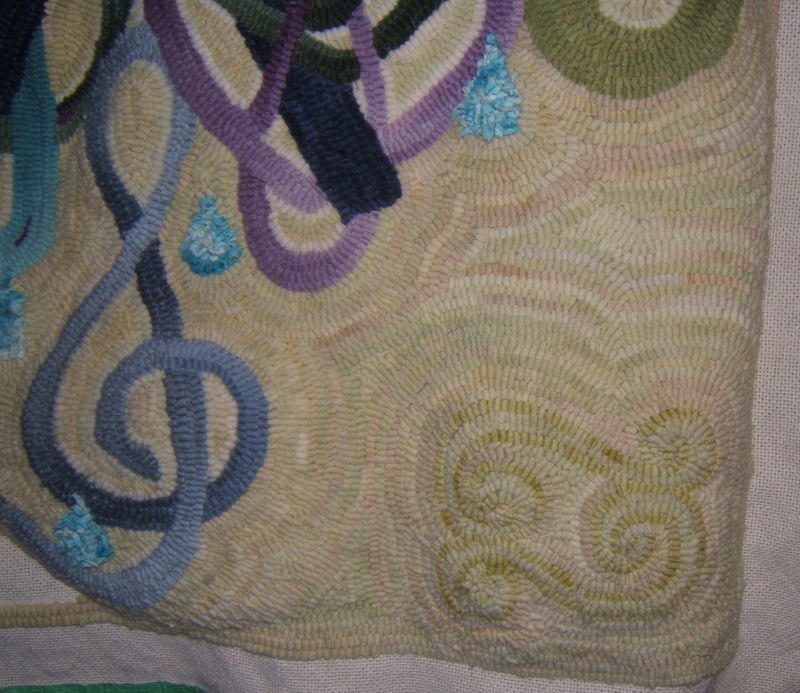 It is a good thing to write about your trials, joys and hmmm things in the world of rug hooking. There is always a lesson to learn if one is open to it. Thanks! Love your new design. I sometimes find myself packing and it is really noticeable when you have circles, which you do. Had you hooked the same distance in a straight line I doubt it would have shown up as much. But in your defense, when you turn a curve you do shorten the thread distance since it is at an angle. That is where we go wrong and I also have to often correct. 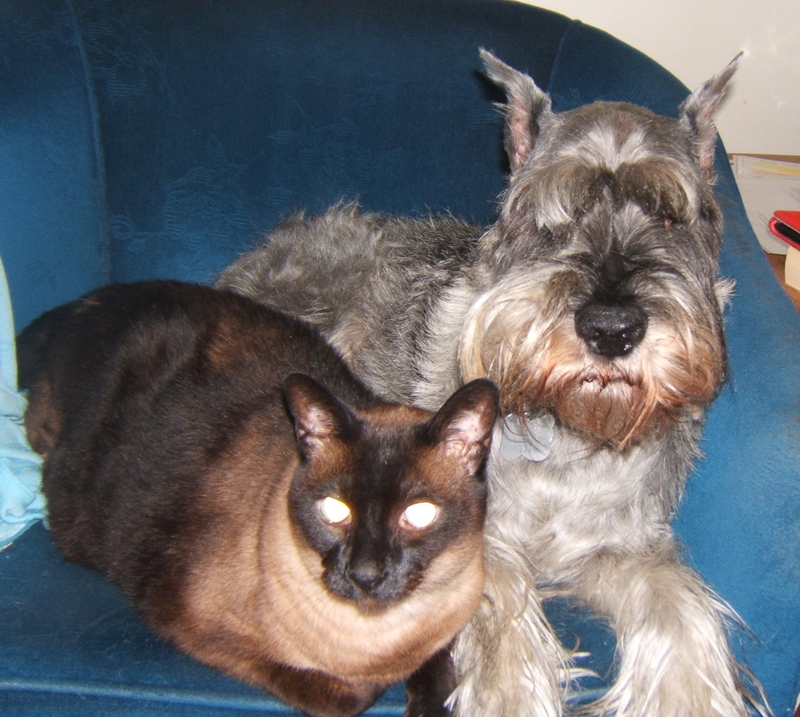 Love your Sealpoint Siamese and reminds me of my departed Pyewacket (yes named from the old movie Bell, Book and Candle). As always Elizabeth learn so much by your example thank you for sharing all you do.